From the vast Serengeti plains to the hills of Kenya’s Maasai Mara over 1.4 million wildebeest and 200,000 zebra and gazelle, tirelessly tracked by Africa’s great predators, migrate in a clockwise direction over 1,800 miles each year in search of grazing territory. 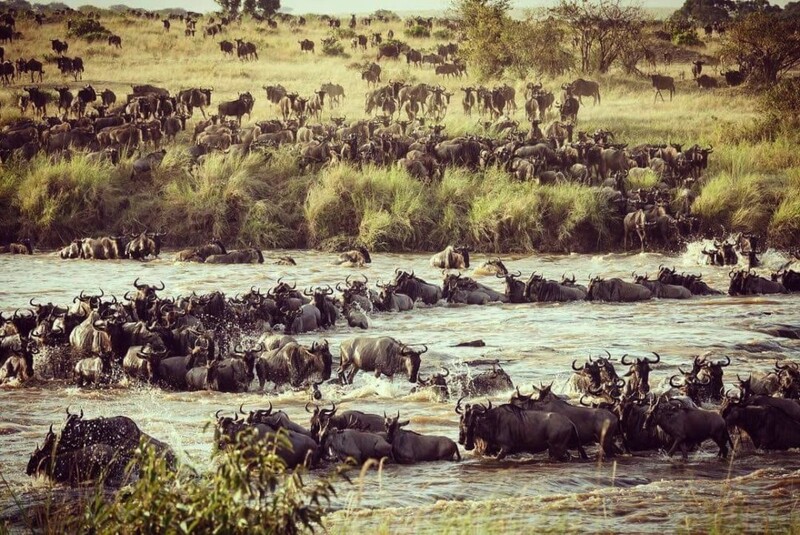 The Serengeti National Park / Maasai Mara Reserve is arguably the most impressive wildlife sanctuary in the world. From mid- December through to March, the vast and unending plains of the southern Serengeti are inhabited by thousands and thousands of wildebeest and zebra. The great herds graze on rain-ripened grass before they begin their incredible journey covering miles of African soil. There is no real beginning or end to a wildebeest’s journey. Its life is an endless pilgrimage, a constant search for food and water. The only beginning is at the moment of birth. An estimated 400,000 wildebeest calves are born during a six week period early each year – usually between late January and mid-March, on the southern plains of Ndutu and Salei in the Serengeti. Nature, being as cruel as it is, is in full swing at this time as the vulnerable calves attract the attention of predators like lion, cheetah and hyena. After the birth of the calves, the wildebeest spread out over the plains of the southern Serengeti. With the advent of the long rains in April and May, the herds have abundant food and water and they take full advantage; roaming across the entire area in search of the richest grazing. By the end of May, with the start of the dry season, the grasses start to vanish and the animals migrate toward the fresh pastures of the northern Serengeti. This movement coincides with the mating season. Small herds start to form as each dominant male gathers up a harem and competes with the other males for the right to mate. The deep lowing of the dominant males and frantic territorial battles resound across the plains as nearly half a million animals breed within the same month, thus ensuring that next year the calving will occur en masse once again. By June the calves born this year are now a strong and healthy 3 – 4 months old, able to keep up with their mothers during the long trek across the plains without slowing down the herd. First one, then another, of the small groups starts to walk north, forming lines that drift across the plains. Rutted paths are left behind as the only sign these vast herds were ever present. 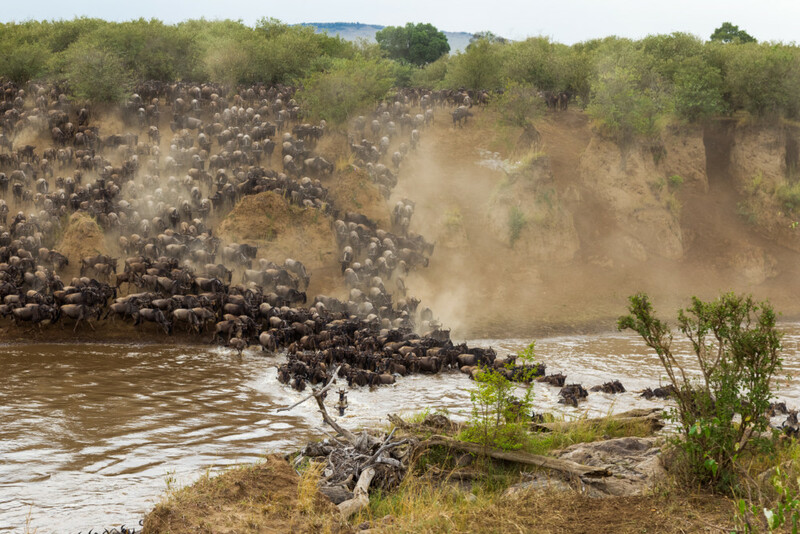 The wildebeest river crossings, with thousands of animals massed upon a riverbank, are probably among the most famous of the wildlife images provided by East Africa’s savannahs. 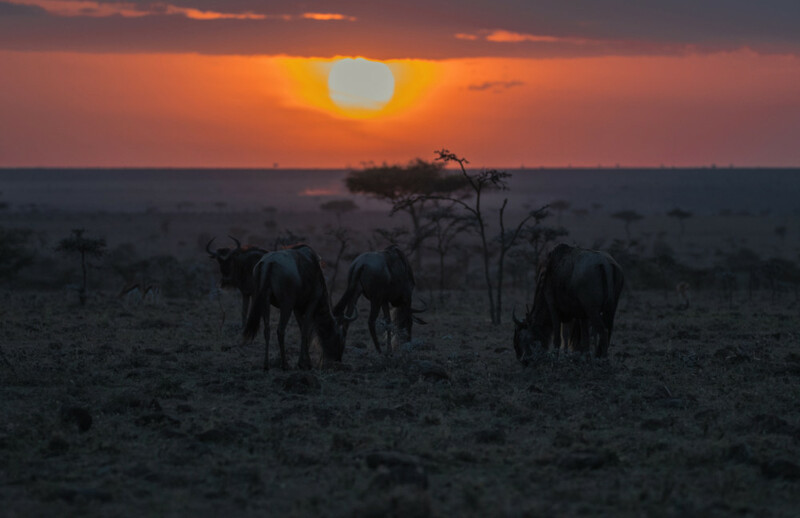 As the wildebeest head north and west in search of new grasses, they meander across the plains of the Serengeti towards the Western Corridor of this vast park, and on into the Maasai Mara Reserve in Kenya. 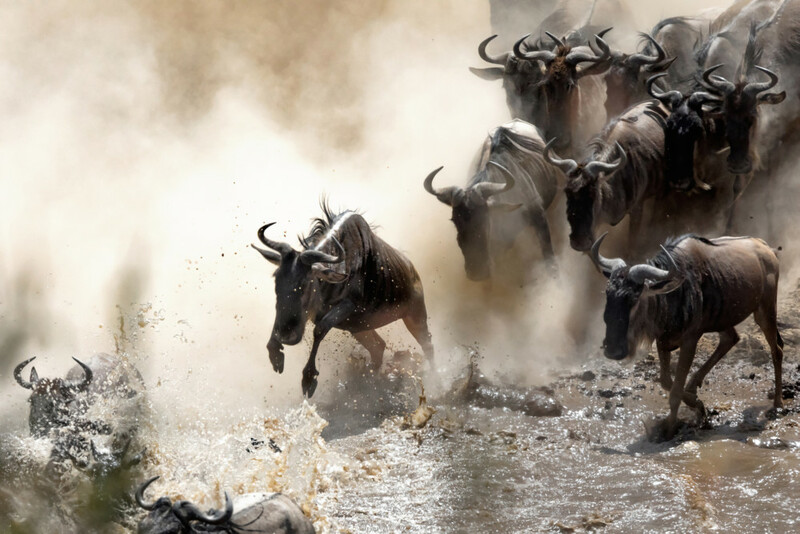 Large rivers, such as the Mara, bisect the savannah and form formidable obstacles to cross, especially for the older, weaker animals and the very young. Home to swift flowing waters and huge crocodiles, the rivers are a challenge to cross at the best of times, let alone when the pressing weight of the herds behind force animals into the rivers without being able to choose an easy route. With rough, rocky bottoms hidden beneath silt-laden waters, the rivers catch many animals unawares, trapping feet or breaking legs after a cliff jump. The moment an animal is unable to move, it is lost. Either to the waiting predators hidden beneath the waters, or simply trampled under the passing herd. The predators wait as well, adding to the mayhem, with crocodiles eating more or less their entire years’ supply of meat in just a few weeks. Lions wait on the river’s edge, pouncing on a skittish calf or thirsty mother. Visiting the Mara during August to October offers a truly unique and unforgettable experience.